Long-term Japanese investor Panasonic has recently announced it would be keen on investing and expanding its manufacturing activities in Vietnam. Panasonic Vietnam CEO Mr. Kazuhiro Matsushita told VET that over the past few years the company has recorded handsome growth in almost all categories, at times reaching into the double digits. “In fiscal year 2017, we recorded approximately 10 per cent growth in the group’s business activities in Vietnam, with the appliance and eco-solution fields growing by more than 20 per cent,” he said. Panasonic and a host of other major investors from many countries and territories worldwide have been present in Vietnam for decades. Considered a promising manufacturing hub in Southeast Asia, Vietnam’s manufacturing and processing sector continues to attract the most foreign investors. Projects from 126 countries and territories in 19 sectors have come to the country, worth $318.72 billion in total. Another highlight of the success of foreign direct investment (FDI) last year was the ongoing relocation of investments by multinational companies from elsewhere. Arriving in Vietnam nearly 50 years ago, Panasonic has now invested in five factories and a research and development (R&D) center, with capital reaching $243 million and employee numbers nearly 8,000. Most recently, its eco-solution factory in southern Binh Duong province doubled in size to meet growing demand domestically and for export. The company has developed a full-function business model, from R&D to manufacturing and distribution and at the same time actively realized its corporate social responsibility (CSR) activities. “We will continue to expand our business in different fields, developing the workforce through R&D activities and human resources development programs, contributing to society through unique educational and environmental projects,” Mr. Matsushita added. Another strategic partner from Japan, the Sumitomo Corporation, is engaged in various business fields in Vietnam, such as infrastructure, manufacturing, real estate, sales of metal products and automobiles, construction of power plants, flour milling, and agricultural chemical sales. The company last year began construction of the Thang Long Industrial Park III in northern Vinh Phuc province, joining Thang Long I in Hanoi and Thang Long II in northern Hung Yen province. Sumitomo has also partnered with the BRG Group to develop the Nhat Tan - Noi Bai urban area project in Hanoi, with total investment of more than $4 billion. Similar to Japanese enterprises, South Korean investors have long been interested in investing in Vietnam because of the country’s large and young population along with rapid economic growth. Doosan Vina, for instance, has been expanding its investments into a variety of key sectors, including power plants, water supply, cargo container crane manufacturing, and high-tech structural steel production. The company and its partners have completed four power plants in Vietnam, adding close to 5,000 MW in total to the national grid. It’s also created 2,000 stable jobs in central Quang Ngai province. Major infrastructure the company has been involved in Vietnam now exceeds $2.4 billion in investment, and 2017 exports reached $170 million. “Since opening in 2009, our ‘Made in Vietnam’ products are now at work in 30 countries around the world,” Mr. Park Hong Ook, CEO of Doosan Vina, told VET. 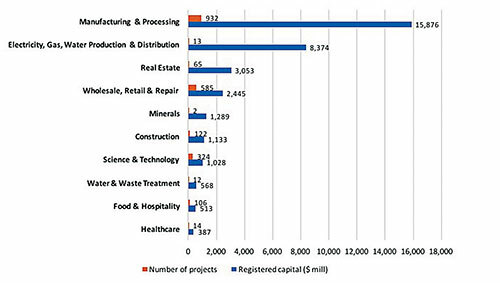 As in previous years, of the 19 industries and sectors foreign enterprises invested in in Vietnam in 2017, most FDI went to manufacturing and processing, with around $15.87 billion, accounting for 44.2 per cent of the total. There was spectacular movement seen in the electricity, gas, and water production and distribution industry, which surpassed the real estate sector to be in second position, with $8.37 billion in investment, representing 23.3 per cent of total FDI. This increased investment was fueled by a number of mega projects in the country last year. The electricity industry has stood out in attracting large amounts of FDI as Vietnam looks to find solutions to increasing supply to meet demand. Among some of the mega projects were three build-operate-transfer (BOT) thermal power projects: Japan’s $2.8-billion Nghi Son 2 plant in north-central Thanh Hoa province, Japan’s $2.58 billion Van Phong 1 plant in south-central Khanh Hoa province, and Singapore’s $2.07 billion Nam Dinh 1 in northern Thai Binh province. Major projects in other industries included South Korea’s $2.5 billion Samsung expansion project in northern Bac Ninh province, the $1.27-billion Block B-O Mon gas pipeline project in the Mekong Delta province of Kien Giang, and South Korea’s $886 million smart city complex project in Ho Chi Minh City’s Thu Thiem New Urban Area, from the Lotte Group. Data from the World Economic Forum (WEF)’s Global Competitiveness Report 2017-2018 revealed major gains for Vietnam, jumping five places from the previous report to 55th position and 20 places from five years ago, putting it among the six economies with the best average growth rates over the last decade. Vietnam’s competitiveness is significantly driven by its market size, which ranks 31st among the 137 economies measured, based on a set of institutions, policies, and factors that determine productivity levels. This growth has been well-evidenced by the impressive surge in FDI over the last year. While economies around the world have suffered from market instability, regulatory changes and business-friendly policies have seen Vietnam thrive. Its economy has remained stable, with GDP growth exceeding the averages posted by neighboring Southeast Asian countries and emerging Asian economies. Its success can be largely attributed to the State’s commitment to creating an attractive business environment for both domestic and international enterprises. Building on the country’s solid foundations, the government has introduced a number of regulatory changes to help increase both FDI and foreign indirect investment. This pro-business attitude has also stimulated growth in the private sector, driving local business and improving competition. By leveraging its political stability, sustainable economy, and high-quality investment opportunities, Vietnam has become an attractive proposition for investors around the world. 2017 was, in fact, a record-breaking year for the economy, which is a very good sign for a better business and investment environment in 2018. Figures from the General Statistics Office (GSO) confirm that the economy performed better than in 2016 and recorded its highest growth for a decade, of 6.81 per cent. Vietnam also attracted the most FDI among Asian countries, with $35.88 billion, up 44 per cent against 2016. With recognition of significant improvements in the country in matters such as electricity access, credit access, and taxes, Vietnam climbed 14 places to 68th among 190 countries in the latest World Bank’s Doing Business 2018 report. Despite reaching record levels of FDI and high economic growth, Vietnam still needs to make significant improvements to institutional performance, human resources skills, and business innovation. “Firms perceive that the lack of an educated workforce constitutes a significant hurdle for doing business,” the WEF report noted. An opinion poll it conducted found that access to financing, an inadequately educated workforce, corruption, poor work ethics, and tax regulations are the five biggest ‘problematic factors’ when doing business in Vietnam. The government has received some praise from the foreign business community for its commitments and efforts to improve the business environment and enhance national competitiveness. However, “the business and investment environment in Vietnam still has room to develop and improve further,” said Mr. Matsushita from Panasonic. Typically, the absence of support industries is behind the low localization rate of just 33.2 per cent, according to the JETRO Global Trade and Investment Report 2017, which is tiny compared to China’s 67.3 per cent and Thailand’s 56.8 per cent. In addition, “sources of highly-skilled engineers need to be more developed in Vietnam to suit the requirements and drastic changes to come from the fourth industrial revolution [Industry 4.0] around the world,” Mr. Matsushita added. According to Mr. Park from Doosan Vina, Vietnam will need to consider three factors to attract more FDI. The first is the economy, as the high levels of growth now recorded need to be sustained. A critical component of growth is power supply, which business and industry needs to be productive. Power is fundamental to any growth, so its development needs to be prioritized. Secondly, the government should ensure that favorable tax, customs, and regulatory conditions exist for people and for businesses. Finally, there needs to be an emphasis on the development of quality HR. To fully capitalize on FDI in the new era, the Ministry of Planning and Investment is drafting an FDI strategy for 2018-2023. With assistance from the World Bank, the strategy will focus on sectors with advantages and that foreign firms can bring more benefits to compared to domestic firms. Vietnam will set out priority sectors for attracting FDI, such as those that need increased value and competitiveness, including manufacturing, service, agriculture, and tourism.